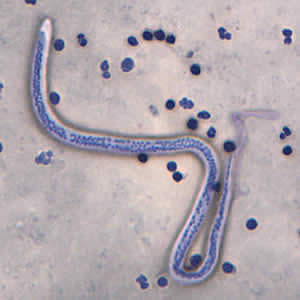 Images from a Giemsa stained thick and thin blood smear were received by you through e-mail. The only case history available was that the patient lived in Africa until the beginning of this year. Attached images A and B are taken from thick smear & Images C, D and E are taken from thin smear. In image C, the object measured 300 micrometers; close-ups of the posterior and anterior ends are shown in D and E, respectively. What is your diagnosis? Based on what criteria? 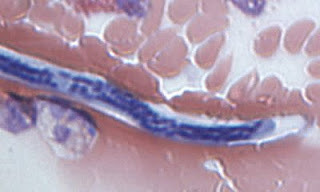 The Microfilaria in these smears were identified as Loa loa, because of its sheath, frequent coiling and relatively dense nucleus. Microfilaria of Wuchereria bancrofti Sheathed. The cells do not extend to the tip of the tail. 2) No nuclei at the posterior end or the tail. 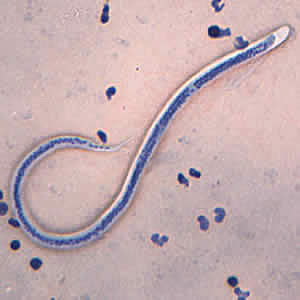 (Brugia malayi has the tail nuclei). Hats off to Maheswari and Anupama for the correct diagnosis of this case.